Most of the time, finding historical gems requires a lot of work and often long hours of arduous research. On rare occasions, they just fall into your lap. It is even more unusual for someone to simply drop one onto your plate. However, for me, such an event occurred at Fort Dixie, Alabama, in July 2018. I was speaking at the Nathan Bedford Forrest birthday celebration when I returned to our table and was surprised to learn that my wife had traded one of my books on General Forrest for Union at All Costs by John M. Taylor. I had never heard of Mr. Taylor before that day, and because he had privately published it, I didn’t expect much out of it, but boy was I wrong! This volume deserves the epaulet “tome” and is a worthy companion to Thomas J. DiLorenzo’s books on Lincoln, The South Was Right! 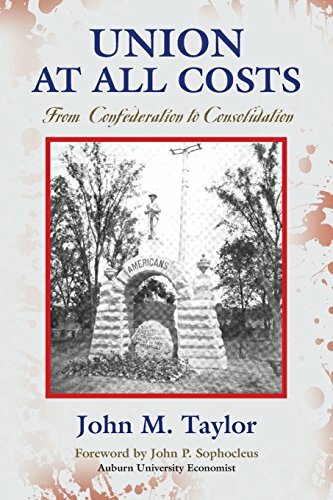 by James R. and Walter D. Kennedy, or the works of Donald W. Livingston, Clyde Wilson, Gene Kizer, Jr., Jim Downs, Donald Livingston, Brion McClanahan, and the scholars of the Abbeville Institute, as well as a growing number of unbiased “neo-Confederate” authors. Taylor begins his journey through American history with the Declaration of Independence. His first three chapters are essentially background material, which is vital for the novice and interesting for those of us who have been studying history since Moses was a sophomore. He is an excellent writer and has a talent for picking up intriguing historical nuggets. Taylor picks up steam with his fourth chapter, when he focuses on Abraham Lincoln, and remains there for the rest of the volume. This is the meat of the book and when it “takes off.” His fourth chapter discusses Lincoln’s background and the beginning of his career as a political huckster. Taylor goes on to describe Lincoln’s early years as a frontiersman, lawyer, and corporate attorney for the railroads, and how that led to his corrupt land dealings in the Council Bluffs, Iowa, area. (Lincoln invested heavily in land there in 1857 and used his office to make Council Bluffs the eastern terminus of the transcontinental railroad in 1861, thus hugely enriching himself.) Lincoln also advocated the subsidizing of railroads (today it would be called “corporate welfare”), in exchange for which the big rail corporations financed his political campaigns. Taylor also discusses several of Lincoln’s other shady deals and corrupt political bargains, but time and space do not allow us to go into all of the “arrangements” here. The author, however, does paint a clear picture of Abraham Lincoln as a slick politician and self-ordained redistributor of wealth (i.e., other people’s wealth—especially Southern wealth). Taylor argues convincingly that, once the South seceded, Lincoln needed a war to bring the Dixie back into the Union, but he had to make it appear that the South started it. (Too many people in the North believed that the South had every constitutional right to secede.) This task he accomplished in a very smooth manner, befitting the slick and incredibly corrupt politician he was. There can be no doubt that the 16th president of the United States rivaled Machiavelli as a political manipulator.